Menin Hotels, Raffaello Hotel, Sanctuary Hotel, Shelborne Hotel and Bentley Hotel. 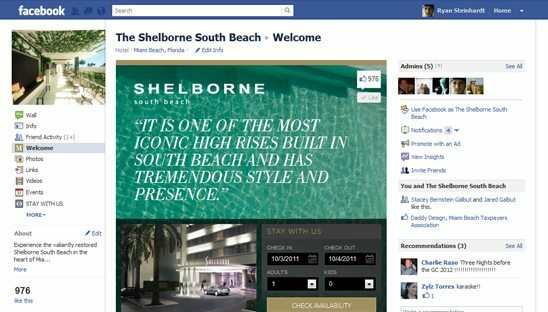 After we designed the Menin Hotels HTML5 website, they hired us to design multiple Facebook pages for all of their hotels. Using one WordPress CMS, all 5 pages have the same type of layout but with different graphics and content. We set up the WordPress Backend so that Menin Hotels can maintain each section for each page with ease. As you can see on the pages, we inserted the booking reservation forms so you can make your room reservation directly on Facebook. Another cool feature we added that you don’t see in many Facebook pages, is an accordion menu for each section. Some of those sections include: photo slideshow, hotel Bio, hotel Specials, directions (using google maps), recent tweet, sharing section and contact info.